GOLDEN, COLORADO -- Any high hopes of sustaining expeditions on the Moon, Mars or beyond will depend on getting "down and dirty" on those worlds -- in the form of using on-the-spot resources. In-Situ Resource Utilization (ISRU), the using of native materials and energy sources collected and processed to support human and robotic exploration, would be crucial to the success of manned space missions as ISRU-derived materials would replace those that otherwise would have to be hauled from Earth. Propellant, energy, water and oxygen, building materials -- all these ISRU products were the topic of discussion at the Space Resources Utilization Roundtable, held here November 1-3 at the Colorado School of Mines. For years, research in ISRU has been slow-going by lack of commitment to long-term human space exploration. However, things seem to be on the upswing. Renewed support for space resources has been unearthed in large measure by the "Exploration Vision" announced by President George W. Bush last January. 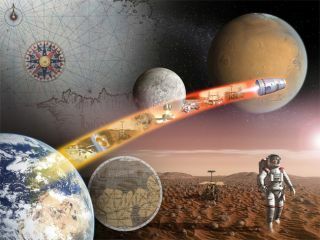 Indeed, space resource proposals are now being considered by NASA's Human and Robotic Technology Program. "There is a range of possibilities for use of space resources in exploration strategy," even before people are dispatched back to the Moon and off to Mars, said Mike Duke, Director of the Center for Commercial Applications of Combustion in Space (CCACS) at the Colorado School of Mines. NASA, however, has yet to adopt ISRU in blueprinting that strategy, perhaps not willing at this point to take some assumptions..."some leaps of faith," he suggested. "There is a feeling that something is finally going to happen. Much of this feeling stems from President Bush's exploration initiative, which specifically calls for the use of extraterrestrial resources," noted G. Jeffrey Taylor, a professor of Geophysics and Planetology at the University of Hawai'i in Honolulu and chair of the workshop's scientific program. The 6th annual roundtable attracted the largest attendance to date, including ex-Apollo program veterans, current space professionals, as well as mining authorities. It is clear that people want something to happen, Taylor emphasized. "The important next step is to do all we can to be sure that in-situ resource utilization becomes an integral part of the exploration initiative," he added, underscoring the stance that ISRU equals sustainability. "We will not have astronauts on other planetary surfaces for long periods of time without the extensive use of local resources," Taylor told SPACE.com. Taylor also pointed to the central importance of robots in exploration. "They will do the heavy lifting as we explore the Moon and Mars, with people doing what they do best...solve problems, make decisions, observe." The Moon is being viewed as a nearby, problem solving place for testing and honing ISRU automated machinery, as well as crafting extraterrestrial processes and procedures. "I always thought that the Moon was kind of a waste as far as sending humans there," said Robert Ash, a long-time ISRU advocate within Old Dominion University's Aerospace Engineering Department in Norfolk, Virginia. Ash said that he had once counted on the International Space Station for flight qualifying autonomous equipment to support human treks to Mars. But the space station's capabilities have been so degraded, now the Moon should be used as a test site, he said. "We could learn enough from surface operations on the Moon to risk the lives of those astronauts that we'd like to send to other planets," Ash stated. "If we use the Moon properly, a failure on the Moon...you bring it back and fix it. On Mars, it's a potentially fatal problem." Given the Moon's proximity to Earth, the communications time lag between the two is 1.28 seconds, Ash observed. "That means that Houston can help." There was a universal cry at the roundtable for new batches of "fake" lunar surface materials, better known as "simulants". Tons of lunar soil simulant, called JSC-1, were developed and characterized years ago under the auspices of NASA's Johnson Space Center, hence the label. Derived from volcanic ash of basaltic composition, JSC-1's composition mimicked many of the attributes of lunar mare soil samples. For one, JSC-1 was churned out to help engineers test and validate ideas for lunar construction, material handling, excavation, controlling dust, agriculture production, making oxygen and sintering -- the heating of small particles to yield larger agglomerations. But quantities of the made-on-Earth lunar simulant are now long gone, with only small amounts still around. "We believe we need a clone for JSC-1 in multi-ton quantities...and it's needed now," said James Carter, a professor of geosciences at the University of Texas at Dallas. He advocated a "root" concoction of simulants that then could be customized in smaller batches with certain attributes ideal for select types of experiments. "You don't just go out and make this willy-nilly," Carter advised. "A production and distribution system has to be set up. This material has to be very well documented and certified. That's absolutely fundamental," he said. Free up Apollo lunar samples? So pressing is the need for lunar regolith simulant materials, NASA's Marshall Space Flight Center in Huntsville, Alabama, in collaboration with the Johnson Space Center, is hosting a workshop January 24-26 on the matter. The hope of that Marshall meeting next year is to decide on supply, production, and distribution requirements for lunar regolith analogs to help master space resource utilization technologies. Another thought voiced is freeing up for experimentation more quantities of the Apollo lunar samples. A portion of those specimens brought back by moonwalkers has already been rung out, scientifically, said Duke of the School of Mines. He is also a former NASA curator of the returned Apollo lunar rock and regolith. "And if you're going to go back and get more, you can do a better job of selecting the sample next time," he added. Duke is principal investigator for Moonrise, a candidate NASA New Frontiers project that would plop down two identical landers near the Moon's south pole. If a go-ahead is given by NASA next year, the goal is to return to Earth five pounds (over two kilograms) of lunar materials from a region of the Moon's surface believed to harbor materials from the moon's mantle. One of the central challenges for NASA's Lunar and Planetary Surface Operations Technology efforts is to validate -- or invalidate -- by 2011 the systems-of-systems level concept of ISRU, especially for the production of oxygen and propellants from lunar resources. The Moon may well be a literal "propellant pit stop". For instance, permanently shadowed craters at the lunar north and south poles could be serving as cold traps for ice molecules delivered to the Moon via comet impacts. Two U.S. Moon orbiting spacecraft -- NASA's Lunar Prospector and the Pentagon's Clementine probe -- yielded data suggestive to some scientists that quantities of lunar ice might be tucked away in craters that never see the Sun. "You have believers and you have non-believers," said Ben Bussey, staff scientist for the Planetary Exploration Group at John Hopkins University's Applied Physics Laboratory in Laurel, Maryland. "And nothing you're going to do with current data is going to change people's minds on this one," he added. Bussey said that ice is a significant resource and it is worth spending some money "to get this question answered one way or the other." There are extensive dark regions at both lunar poles, he said, "and these represent potential locations for ice deposits." Europe's SMART-1 spacecraft is nearing the Moon and will be captured in lunar orbit mid-month. India, Japan, China, as well as NASA's Lunar Reconnaissance Orbiter, will follow in subsequent years and help pin down the ice issue and other lunar resource questions too. The outlook that comets rained in on the Moon should also mean that always shadowed lunar zones contain more than just water. Robert Wegeng, NASA's acting manager of the technology maturation program in the Office of Exploration Systems, said that ammonia, methane, carbon dioxide and other materials should be present too. "I would be delighted if it turns out that there's a lot more than water there," he said. Even if water isn't present, "I don't think by any means it's a loss," Wegeng said. Most of the mass advantage comes from oxygen production, not from hydrogen production, he said. Oxygen is a plentiful resource on the Moon that can be extracted for life support needs and as a propellant oxidizer for space and surface vehicles. The price tag for exporting all oxygen needs for a lunar base from Earth is high enough to warrant serious investigation of made-on-the-moon oxygen. "To me this implies we want a two-pronged attack at the moment. We need to keep our options open," Wegeng advised. NASA has recently scripted a trio of piloted design reference missions to the Moon: a single short stay of 7 days duration near the Moon's equator; multiple short stay missions, but with astronaut crews having access to other lunar spots; and a scenario whereby explorers stay on the Moon for short and medium-length time periods at one area -- preferably at a lunar pole locale. Still to be hashed out, however, is how In-Situ Resource Utilization would best be incorporated in any lunar setting -- and what lessons learned might apply to a future Mars voyage by humans. One avenue gaining support is landing a robotic craft on the Moon outfitted with several types of ISRU experiments. Maybe a campaign of ISRU research flights is warranted. Oxygen might be puffed out by lunar processing equipment. Perhaps a silicon solar cell could be concocted, or a wedge of radiation shielding. Or what about a payload that flies over the cratered landscape fueled by made-on-the-moon propellant? Whatever the example, for advocates of ISRU, it is show and tell time.